As the men set up their roadblock somewhere south of Baraque de Fraiture, they could hear Germans digging in within hearing distance of the tank destroyers who were also digging in. Lt. Orlando told on more than one occasion while attending reuinions of the 643rd TD Battalion in the 1980s and 1990s that he went back to Capt. Woodruff's CP to request infantry support. Capt. Woodruff told Lt. Orlando he had no infantrymen that he could provide. I haven't talked to any of the survivors who remember hearing that Lt. Orlando told them of Capt. Woodruff''s report that he could not provide infantry suport. The possibility does exist that Lt. Orlando reported it to platoon sergeant,S/Sgt George H Caldwell, and they thought it best that the men would be further concerned if they knew. As you can see, my mention of this possibility only adds more uncertainty to the situation. The gun crews and security section men tried to get some sleep after finishing digging in. In the early morning (reports that men have told me vary about the time) artillery or mortar shells began coming in. Soon German infantry began overrunning the positions of the 76 mm gun emplacements under the command of Sgt Frank Martinelli and Sgt Joseph Giordano. Sgt Giordano was killed and Sgt Martinelli was taken prisoner. Some members of their gun crews were wounded, some taken prisoner, and others were reported MIA (missing in action) after this encounter with the Germans. 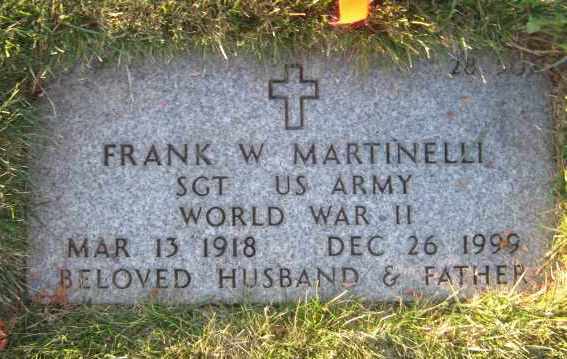 Frank´s Grave Marker on MA National Cemetery.